The wishbone offense, whose introduction to Football Bowl Subdivision (formerly Division I-A) college football is credited to Emory Bellard, is named after its base formation of a quarterback, a fullback aligned four to five yards behind the quarterback, and two halfbacks aligned on each side of the fullback and one yard to two yards deeper. The result is a backfield alignment that resembles the shape of a wishbone. Also called the triple-option, this base formation allows three basic running options: the fullback receiving the handoff, the quarterback pitching to either halfback, or the quarterback running the ball himself. While the wishbone's success reached its zenith in the 1970s, it remains popular at the high school and small college level but is nearly extinct at major college programs. The traditional "wing T" offense employs many of the concepts of the wishbone offense. It often employs three running back formations, especially in the Bay City version of the offense. The wing T helped change the game of football in its formative years, and changed the traditional role of the quarterback from a blocker much like a modern fullback in the classic "single wing", to the primary distributor of the ball. As the triple-option became prominent, the wing T quickly incorporated the veer into its arsenal. In conjunction, it tends to employ significantly more misdirection running plays. The traps, crosses, fakes, pulls, sweeps, and counters that characterize the wing T are often supplemented by a heavy dose of option runs—most notably the veer triple option. The veer is well suited to the wing T offense, especially the Delaware version. The Delaware version of the wing T, with its predominant two running back sets, gained significant prominence in the late 1970s and early 1980s and was most notably employed by the Notre Dame Fighting Irish during the Parseghian era. It continues to be employed by high schools and small college teams. The typical flexbone formation. This variation of the wishbone adds spread-like qualities to the standard triple-option configuration and is popular amongst service academies. The "Flexbone" was invented by Emory Bellard at Mississippi State in 1979. It was called the "Wingbone", a variation of the Wishbone Bellard originally invented. A variant of the wishbone offense, the flexbone came to prominence in the 1980s and 1990s. The flexbone offense varies from the wishbone in a few fundamental ways. First, and most notably, the flexbone replaces the halfbacks that are aligned in the backfield of a wishbone with one or two "wingbacks" or "slot backs," that align off-tackle or off-end. These "hybrid" players are typically very quick and must be adept at running, blocking (particularly cut blocking), and receiving. Because of their positioning, they can more easily facilitate the passing game in the flexbone and serve to stretch the defensive alignment laterally prior to the snap. Teams that employ this scheme tend to amass consistently high rushing averages. The name "flexbone" is somewhat controversial and usually reflects the school of thought from which the offense was born. Some practitioners, such as Air Force's famed former head coach, Fisher DeBerry, welcomed the name flexbone because the offense was seen as a modification of the traditional wishbone. Still others, such as Paul Johnson reject the moniker, preferring instead to call their systems, the "spread offense". To these practitioners, the offense is more related to spread schemes such as the run and shoot, and simply uses the triple-option as a foundation instead of a dynamic passing game. The offense was actually born in the latter school of practitioners, with its origins attributed to Paul Johnson while at Georgia Southern in the mid-80s. He brought the system briefly to Hawaiʻi in the late '80s and then returned to Georgia Southern, which won a record six Division I-AA national titles and eight conference titles while using this offense. As traditional wishbone coaches sought to make their offenses more dynamic, they began to mimick the alignments of this "spread offense" and re-dubbed it the flexbone. The name has since stuck, most likely in order to prevent confusion with other spread offenses. By the late '90s, the flexbone was adapted by all three NCAA Division I-A military academies, where it provided strong statistical results. After bringing Navy to its greatest run of success in decades, Johnson brought the offense with him to Georgia Tech, where it has achieved great success. Also known as the "Nebraska I-offense," this offense derives its name from its extensive use of the I formation with its vertical alignment of quarterback, fullback, and running back. Though balanced attacks from the I formation have been around for decades, the I-option gained extraordinary popularity with its employment by Tom Osborne at the Nebraska Cornhuskers. Using this offense, Osborne had outstanding success from the time of its introduction in 1980 until his retirement in 1997, including three national championships. His successor, Frank Solich, continued to have success with the offense until his departure in 2003. The I-option offense offered a more traditional balanced attack. At its core, the offense relies on a devastating combination of power running, the option, and play-action passing, which are easily run from the I-formation and its variations. The concept of a balanced offensive attack combined with the big play potential of the option enticed vast numbers of top-level college teams to include some components of the Nebraska I. Emerging during the late 1990s and 2000s, the spread option is typically run from any variant of the shotgun formation, as in the example above. The "spread" allows teams to use speed  and athleticism to exploit gaps created by the wide distribution of players. The spread option offense is a variant of the more generic "spread offense". It has found success and widespread employment in college and high school football. Essentially a hybrid of the traditionally pass-oriented spread offense, the spread option is based on the concept of defensive isolation. The offense "spreads" the defense by aligning in three-to-five receiver sets, using two or fewer running backs in the backfield and often setting the quarterback in shotgun. This spread forces the defense to defend more of the field and isolates its players in space. To exploit this, the offense employs double or triple option plays which further mitigates the athleticism of the defense and forces it to play their assignments. When used in combination with a consistent passing game, the spread option offense can yield strong results. The means by which option plays are run from the spread option offense vary greatly. The most popular running play employed in the spread is the read option. This play is also known as the zone read, QB choice, or QB wrap. 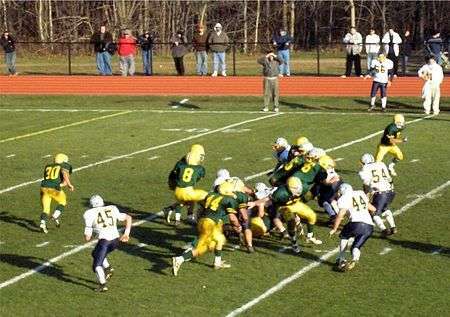 A type of double option, the read option is a relatively simple play during which the offensive line zone blocks in one direction, ignoring defensive personnel, while the quarterback makes a single read (usually of the backside defensive end or linebacker) and decides whether to keep the ball (if the backside defender crashes down) or to hand off to the back (if the defender indicates that he will cover the quarterback). Others have found even more innovative ways to run the option from spread formations. Creative use of motioning schemes has enabled wide receivers and even tight ends to become ballcarriers as evidenced by Wake Forest's version of the spread employed during the mid-2000s. Rich Rodriguez is credited with inventing the zone read play run out of the shotgun formation. Other pioneers include Ohio State University coach Urban Meyer, Kansas State Wildcats Coach Bill Snyder, and former Oregon coach Chip Kelly. At the heart of all option offenses is the option run. This relatively complicated running play may take on many forms. All option runs, however, rely on two common principles: Whereas the traditional running play typically designates the ballcarrier prior to the snap, the ballcarrier in a true option running play is determined by reading the defensive alignment or the actions of defensive players. This may occur at the line of scrimmage or after the ball is snapped. The second principle of the option run is that it must include two or more potential ballcarriers. These individuals each perform a predetermined route, or "track" that poses a unique threat to a defense. By threatening to attack the defense in multiple ways during the play based on the defense's own actions/alignment, the option run forces the opponent to maintain extraordinary discipline. Defenders must focus on their assignments, which stresses the defense and often mitigates its speed, size and aggressiveness. Consequently, option offenses are excellent for undersized teams. Option running plays are as numerous as the schemes that employ them. However, nearly all option running plays can be characterized as either a double option or triple option. This is determined by the number of choices available during the play. In these highly complex running plays, three potential ballcarriers are available. The triple option typically features three components: a "dive" track, a "keep" track and "pitch" track. In its most generic version, the inside/outside veer, the dive track is typically carried out by a running back. At the snap of the ball, this player attacks the line of scrimmage somewhere between the offensive tackles (or end in the outside veer) as designated by the type of triple option play. This player is often the first choice in the triple option. His goal is to quickly attack the defensive interior in order to either pick up yardage or freeze the defense and prevent their pursuit to the outside. This quick surge into the interior of the defense is traditionally called a "dive". The quarterback determines whether to hand the ball to the fullback by reading a "dive key" - usually a defensive end. If the dive key does not try to tackle the running back the quarterback will hand the ball off to him. Alternatively, if the defender attempts to tackle the running back, the quarterback will keep the ball himself. This decision usually takes place while both the dive back and the quarterback are holding the football in an intricate exchange called the "mesh". On the keep track, the quarterback may run upfield for yardage or pitch the ball to another ballcarrier on the "pitch" track. This player is called the "pitch back" and the quarterback determines whether or not to pitch the ball by reading the "pitch key" - usually a linebacker or defensive back. The double option is an effective cousin of the triple option. As the name indicates, the double option provides only two potential ballcarriers instead of three. Yet it often relies on speed, or misdirection to compensate for the reduction. A very popular type of double option is the Read Option. It is typically run out of the shotgun formation. The quarterback reads the defensive end on the side in which the play is designed to take the running back. If the defensive end is playing outside the tackle after the snap of the ball, the quarterback hands the ball off to the running back. If the defensive end is playing inside of the tackle after the snap, the quarterback keeps the ball and runs counter to the blocking scheme. This scheme has been successfully utilized by former Texas Longhorn quarterback Vince Young, Chase Daniel of Missouri, Juice Williams and Rashard Mendenhall of Illinois, the 2007 Heisman Trophy winner Tim Tebow of the Florida Gators, West Virginia Mountaineers quarterback Patrick White and running back Steve Slaton, Oregon Ducks' Dennis Dixon and Jonathan Stewart as well as the 2010 Heisman Trophy winner Cam Newton of the Auburn Tigers. The option offense is most frequently utilized in the high school and collegiate ranks. It is rarely used in the National Football League for several reasons. First, the speed and athleticism of NFL defenders negate the advantages of an option offense. Second, option quarterbacks are hit and tackled frequently. Few professional teams, whose quarterbacks have multimillion-dollar contracts, are willing to assume this increased risk of injury. There has been a resurgence of option offenses in major college football. When implemented properly, option offensive schemes can be very successful, as demonstrated by the success of the Nebraska Cornhuskers, Oklahoma Sooners, Georgia Southern Eagles, and Syracuse Orange in the 1970s through the early 2000s. Despite its success, though, many teams favor more "pro-style" offenses that attract athletes who may want to play in the NFL, where option offenses are less popularized. Recently Urban Meyer and other coaches have developed extraordinarily competitive schemes using an option attack out of the shotgun formation. Meyer visited Kansas State University's Bill Snyder and learned the principles of his system. These combine elements of the West Coast offense and the single wing with sorted elements of the flexbone and the wishbone. Meyer used his spread option offense with great success at Bowling Green, Utah, and Florida, where he won two Division I FBS national titles, and at Ohio State, where he won the 2014 College Football Playoff championship. Meyer's version is based on the spread attack developed by then-West Virginia coach Rich Rodriguez. Rodriguez earned "pioneer" status for incorporating wishbone principles, such as the zone-read and option pitches, into the primarily passing-oriented spread offense. However, it is unclear whether Rodriguez developed the system, Kansas State coach Bill Snyder developed the zone-read philosophy with QB Michael Bishop in the late 1990s, or whether the two coaches coincidentally developed the system at the same time. The option remains popular at mid-major levels as well. The Appalachian State Mountaineers, who won three consecutive titles in Division I FCS from 2005 through 2007, rely on the spread option offense. Additionally, the Cal Poly Mustangs achieved success with its flexbone-style option offense under former head coach Rich Ellerson, who has since installed the offense at Army. Lenoir-Ryne played for a NCAA DII National Championship in 2013 running the flexbone. Carson-Newman, Eastern New Mexico, and Harding have had a great deal of success running the triple option at the NCAA Division II level. Option offenses are considered to be "equalizers" on the playing field – allowing less athletic teams to compete with larger and faster defenses. Appalachian State proved this theory by defeating the heralded Michigan Wolverines at Michigan Stadium during the 2007 NCAA season. In 2013 GA Southern (FCS at the time) defeated Florida and in 2015 Citadel (FCS) defeated South Carolina. Option offenses remain very popular among the United States service academies. The Navy Midshipmen, Army Black Knights, and Air Force Falcons each use option offenses. If run properly, an option offense should be able to gain 2-3 yards before the linebackers and defensive backs can identify who has the football and make a tackle. Due in part to this, Navy rarely punts the ball, which has led many Navy fans to jokingly refer to 4th down (normally a punting situation) as "just another down." Coach Paul Johnson was particularly effective using this offensive scheme, leading Navy to 43 victories between 2003 and 2007, and Navy led the nation in rushing yards and rushing touchdowns in 2007. 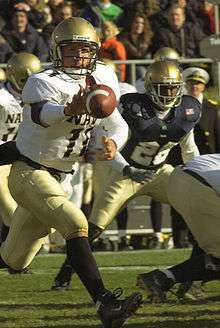 He left Navy for Georgia Tech after the 2007 season, where he continues to successfully run the option. Former Army coach Bob Sutton joked that the Army–Navy Game could be played in an hour because the game clock rarely stopped due to both teams running option schemes. After Sutton's firing, Army went away from the option in favor of a Pro Style attack under new head coach Todd Berry. After eight years of poor performance on the field (with a record of 17-76 from 2000-2007 including the only 0-13 season in NCAA history), Army returned to a flexbone triple-option scheme in the 2008 season. Many Army alumni pushed for a return to an option-based offense in hopes of regaining the success they saw under head coach Jim Young in the 1980s and early 1990s. Under Young, from 1983–1990, the cadets went 51-39-1, including 3 bowl appearances. With the beginning of spring practice 2008, Army coach Stan Brock closed practices to the fans and media in order to install the new offensive scheme. In mid-April, the Times-Herald Record broke the silence and eased alumni concerns by announcing that Brock and Army would return to the triple-option offense for the 2008 season. Though Army improved statistically, they failed to achieve a winning season, and in December 2008, Army Athletic Director, Kevin Anderson announced Brock's dismissal after only two seasons. Later that month, the team welcomed famed Cal Poly head coach Rich Ellerson as the 36th head coach at West Point. In his first season (2009) on the banks of the Hudson, Ellerson implemented his version of the option and led the Cadets to a 5-7 season. The team showed a marked improvement from the previous 10 years, missing a bowl game by one game. The United States Air Force Academy also ran the option successfully under coach Fisher DeBerry, often having a run offense near the top of the NCAA. Falcons option quarterback Dee Dowis was a finalist for the Heisman Trophy in 1989, setting an NCAA record for rushing by a quarterback, with 3,612 yards. The option helped the team win the Commander-in-Chief's Trophy 16 times, the most among the three major football-playing service academies. Current Army head coach Jeff Monken has extensive experience running the option. Before taking over the Army program in December 2013 he sereved as head coach of Georgia Southern University. His experience working under Paul Johnson at Georgia Southern, Navy and Georgia Tech made him an attractive choice for the position. Until recently, the option has made rare appearances in the NFL. An article on the option play in the ESPN College Football Encyclopedia discussed why the option was not used as much in the pros. While coaches agreed the option would work, the problem was the impact it would have on the quarterback. The quarterback would need to run more which means taking more hits, causing greater risk of injury. Starting in 2004, Michael Vick, Warrick Dunn and T. J. Duckett ran the option with a degree of success not seen in the NFL before. In a December 2007 game against the New England Patriots, the New York Jets ran the option with quarterback Brad Smith, substituting Smith for starter Chad Pennington. In the 2008 AFC championship, Ravens QB Joe Flacco ran a QB option tucking the ball for a 5-yard gain and a first down on crucial third down. The Ravens offense was known for mixing up its game plan, and although Flacco is not known for his speed, the deception employed by Baltimore allowed for Flacco to mix up plays successfully despite an AFC championship game loss. In the 2009 season, the New York Jets ran the option numerous times, with Brad Smith. Each play produced positive yards. The Tennessee Titans also ran the option when Vince Young was re-installed as quarterback. In addition, the option helped Chris Johnson rush for 2000 yards. In October 2010 against the Oakland Raiders, David Garrard performed an option run and kept the ball for a 24-yard run to set up a FG. On October 9, 2011, the Carolina Panthers effectively ran the option twice against the New Orleans Saints. The first play was an option pitch from QB Cam Newton to RB DeAngelo Williams for a 67-yard touchdown. The second time, Cam Newton kept the ball and ran for 13 yards. A month later, the Denver Broncos ran seventeen plays with Tim Tebow as quarterback and Willis McGahee as running back totalling 298 yards on the ground. The option was so effective that the Broncos played it almost exclusively in the fourth quarter of the 38-24 win over the Oakland Raiders, continued using it a week later in a 17-10 win over the Kansas City Chiefs, and again employed it a week later in an overtime win over San Diego. In that win over San Diego, Tim Tebow set an NFL record 22 rushing attempts by a quarterback in one game. The 2011 Denver Broncos, with Tebow at quarterback, have been the most successful team in the NFL to run a read-option offense. The 2012 season saw more NFL teams adopt the option offense, the most prominent being the Washington Redskins, the Seattle Seahawks and the San Francisco 49ers. 49ers quarterback Colin Kaepernick rushed for 181 yards (a NFL single game record for a QB) on 16 carries using the read option out of the pistol formation vs. the Green Bay Packers in a Divisional Playoff game on January 12, 2013. As a team, the San Francisco 49ers rushed for 323 yards on 43 carries. The 2013 season saw Oregon University's head coach Chip Kelly move to the NFL to take the head coaching job for the Philadelphia Eagles. At the start of the season, Michael Vick was named the starting QB and the read option was used with Vick's athletic ability to take advantage of running situations for the quarterback. However, by the 6th week, Vick was injured and Nick Foles took over as starter. Even though Foles had less running ability than Vick, the read option was continued and used successfully. The theory that the read option can work even with pocket passers is that as long as the quarterback can get positive yardage, big gains are not necessary as it keeps the defense honest. The use of the read option in the NFL has been somewhat controversial, the main reason being that it puts the QB at greater risk of injury. 1971 Oklahoma: Went 11-1 and scored 530 points. 1972 Oklahoma: Went 11-1 and scored 399 points. 1973 Alabama: Went 11-1 and scored 477 points. 1974 Oklahoma: Went 11-0 and scored 473 points. 1975 Alabama: Went 11-1 and scored 374 points. 1977 Alabama: Went 11-1 and scored 380 points. 1978 Oklahoma: Went 11-1 and scored 471 points. 1979 Alabama: Went 12-0 and scored 383 points. 1983 Air Force: Went 10-2 and scored 367 points. 1985 Air Force: Went 12-1 and scored 470 points. 1985 Georgia Southern: 13-2 and scored 460 points. 1986 Georgia Southern: 13-2 and scored 619 points. 1987 Oklahoma: Went 11-1 and scored 493 points. 1988 Arkansas: Went 10-2 and scored 349 points. 1988 Georgia Southern: 12-3 and scored 469 points. 1988 Notre Dame: Went 12-0 and scored 339 points. 1989 Arkansas: Went 10-2 and scored 385 points. 1989 Georgia Southern: Went 15-0 and scored 584 points. 1989 Notre Dame: Went 12-1 and scored 427 points. 1991 Air Force: Went 10-3 and scored 382 points. 1991 Syracuse: Went 10-2 and scored 321 points. 1992 Hawaii: Went 11-2 and scored 421 points. 1992 Notre Dame: Went 10-1-1 and scored 437 points. 1992 Syracuse: Went 10-2 and scored 340 points. 1993 Notre Dame: Went 11-1 and scored 427 points. 1994 Nebraska: Went 13-0 and scored 459 points, winning the national championship. 1995 Nebraska: Went 12-0 and scored 639 points, winning the national championship. 1996 Army: Went 10-2 and scored 379 points. 1997 Air Force: Went 10-3 and scored 279 points. 1997 Nebraska: Went 13-0 and scored 607 points, winning the national championship. 1998 Air Force: Went 12-1 and scored 468 points. 1998 Georgia Southern: Went 14-1 and scored 654 points. 1999 Georgia Southern: Went 13-2 and scored 747 points. 2000 Georgia Southern: Went 13-2 and scored 506 points. 2001 Georgia Southern: Went 12-2 and scored 525 points. 2002 Georgia Southern: Went 11-3 and scored 493 points. 2009 Georgia Tech: Went 11-3 and scored 473 points. 2010 Auburn: Went 14-0 and scored 577 points, winning BCS championship. 2011 Georgia Southern: Went 11-3 and scored 492 points. 2013 Auburn: Went 12-2 and scored 553 points, BCS runner-up. 2014 Air Force: Went 10-3 and scored 409 points. 2014 Georgia Tech: Went 11-3 and scored 530 points. ↑ Weber, Bruce (February 10, 2011). "Emory Bellard, Creator of Wishbone Offense, Dies at 83". The New York Times. Archived from the original on September 30, 2011. ↑ Zillgitt, Jeff. Defense can't make tackle until it locates the ball. USA Today. 19 August 2006. Retrieved 8 February 2013. ↑ Chen, Albert. Options All Around. Sports Illustrated. 16 November 2009. Retrieved 9 February 2013. ↑ Viera, Mark. Georgia Tech's Offense Is Becoming a More Viable Option. Washington Post. 14 October 2009. Retrieved 8 February 2013. ↑ Viera, Mark. Talking Option With Nebraska's Tom Osborne. Washington Post. 14 October 2009. Retrieved 8 February 2013. ↑ Streelman, Erick (1 November 2015). "Speed Option". With With The Pass. Retrieved 25 February 2015. ↑ Jacoby, Terry. The Secrets of Urban Meyer's Spread Option Offense. American Football Monthly. June 2006. Retrieved 9 February 2013. 1 2 Farrar, Doug. Broncos follow trend to maximize Tebow’s ability. Yahoo! Sports. 11 November 2011. Retrieved 12 November 2011. ↑ Reiss, Mike. It was just like old times. Boston.com. 17 December 2007. Retrieved 12 November 2011. ↑ Playbook: Titans vs. Texans recap. NFL Network. 24 November 2009. Retrieved 12 November 2011. ↑ Strickland, Bryan. Panthers fall in final minute. Carolina Panthers. 9 October 2011. Retrieved 12 November 2011. ↑ Notes: Read Option No Easy Read for Raiders D. MaxDenver.com. 7 November 2011. Retrieved 12 November 2011. ↑ . Notes: Broncos' Option confuses Chiefs. Kcommunitynews.com. 13 November 2011. Retrieved 13 November 2011. ↑ Sando, Mike. Optional reading for Seahawks-Redskins. ESPN. 3 January 2013. Retrieved 29 January 2013. ↑ Branch, Eric. Read (option) all about it: Efficient Kaepernick seals win with 50-yard run. San Francisco Chronicle. 9 December 2012. Retrieved 29 January 2013. ↑ Colin Kaepernick sets QB rushing mark as Niners oust Packers. ESPN. 12 January 2013. Retrieved 29 January 2013. Nuwer, Hank. Strategies Of The Great Football Coaches. New York, New York: Franklin Watts, 1988. Print.